in Kid Food, Sugar and Spite, Sweet! Everybody watched Tuesday’s historic inauguration of Barack Obama as 44th president of the United States, even the kids. That afternoon I picked my 8-year-old up from school, and he described watching it with his teacher and classmates. We were in Trader Joe’s picking up milk and other groceries. “Nice try,” I told him. I’m hardly the first to make an Obama Cupcake. The women at Cupcakes Take the Cake blog did gangbusters with the idea, but then they’re pros. My Obama cupcakes are not chocolate. They’re golden cake, (like Michelle’s dress!) topped with vanilla butter creme frosting, and garnished with orange zest. No particular reason, other than I didn’t have chocolate to melt down and make chocolately-goodness from. And why the orange zest? Dunno. It just sounded good at the time. The result: Millions of Americans would congregate on the Mall to sing Hail to the Chief to these cupcakes. For cupcakes, preheat oven to 350. Butter up the muffin tin and then put your cupcakes papers in (the cake will spill over the top when baked). Using an electric mixer, cream the butter until smooth, then gradually add the sugar. Beat until light, 3 or 4 minutes. Beat in the eggs or the yolks (I used eggs) one at a time, then the vanilla or orange zest, and the almond extract. Combine the flour, baking powder and salt and add to the egg mixture a bit at a time, stirring in milk as needed. Stir until just smooth. Fill the cupcake papers almost to the brim. Bake for 20-25 minutes or until golden brown. Cool on a rack. Frost and serve without the paper. Beat the butter until creamy and gradually work in the sugar, adding milk as you go as needed. Add the vanilla extract and the orange zest. Frost those cupcakes. For a final splash of color, I tossed on some grated orange peel. No photo. Just the iconic painting by Wayne Thiebaud, one of my favorite artists. Maybe these aren’t as fancy as the gal who used to do the Cupcake blog could turn out, but then nobody at my house needs fancy. They just need edible. And sometimes they need cupcakes to mark an occasion. I’ve got two waiting for Malia and Sasha, but they’d better hurry if they’re going to claim them. They’re going fast. It was a sweet end to a historic day. OK, that had me guffawing. Well played son, well played. 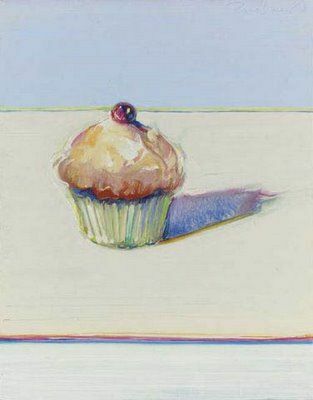 First off, love love love Wayne Thiebaud. Hey, maybe cupcakes are my way back to the canvas?! Ya know, it is possible to ship foodstuffs. But not some crazy distance like cross-country. Only something sensible like up-state. Wow, you called you kid’s bluff, but at the end who really won? Congrats, I wouldn’t dare make cupcakes w/o a store bought cake mix.